That is a quote from the guys promoting this game on Google Play - And strangely enough it's true, the ease of play, jolly music, non-intrusive ads, and crisp graphics make this a thoroughly enjoyable idle clicker. There is nothing too complicated about getting started in AdVenture Capitalise, you basically tap on the bar to the top right of the lemon. That will get you started, and from there, and after a whole load of tapping you'll be making billions in minutes! Where we will help is to give you some guidance in where best to spend your money earned in the game and what can be unlocked as you play the game more. Each time you tap the top bar to the right of the lemon you will purchase another lemonade transaction, this will give you the money indicated in the top right bar. When you have enough money, the lower bar next to the lemon will be orange, at that point you can purchase another lemonade stand and it will increase your profits each time you tap the top bar. Now take a look at the bar under the lemon, as you tap the lower bar to the right of the lemon, the bar under the lemon should slowly turn orange. Once it is filled you'll get a multiplier effect and each transaction will take half the time, therefore doubleing your profits! There is a point however that you don't want to have too many of these multipliers. For lemons and the other initial businesses the max you really want to go to is 100. And you should really be focusing on starting new businesses. There are also other things like upgrades and managers which would be more economical to buy than increasing the speed multiplier of starter businessed. As new businesses become available (by the bars turning orange), purchase them and start the transactions. 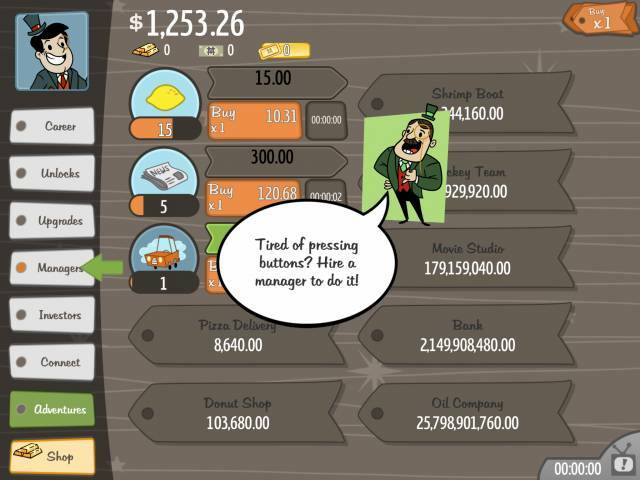 Now you've got started here are some cheats, tips and strategies to help you really start making the billions in AdVenture Capitalist. 1. Before you stop playing spend everything! Take a look and see if any upgrades or managers are available before you stop playing and purchase those, therefore while you are away from the game you'll receive the benefit of those upgrades immediately instead of the cash just sitting there. The new businesses that become unlocked after you have earned a certain amount of money will generally be worth purchasing as soon as they become available as another revenue stream. Another cool tip would be to look out for the light on the managers tab on the left of the screen turning orange, that indicates that a manager is available to purchase for a business. It basically means you no longer have to keeping to top bar of each business - The manager will do it for you. Some call that cheating, we just call it progress! Focus on one business to fill the orange bar under the item. This is done by buying more of the same item. Initially you need to get to 25, 50, then it goes up in fifties. Our tip is that you only take the queues to 50 first of all until you have a lot of the businesses unlocked. If you take the number under the business too high, then it just gets too expensive to progress, and you should really focus on newer businesses that are cheaper to upgrade. Also on the right, look out for the indicator on the upgrades tab to go orange at that point you should check out what is available, it is usually a good decision to purchase what has become available. 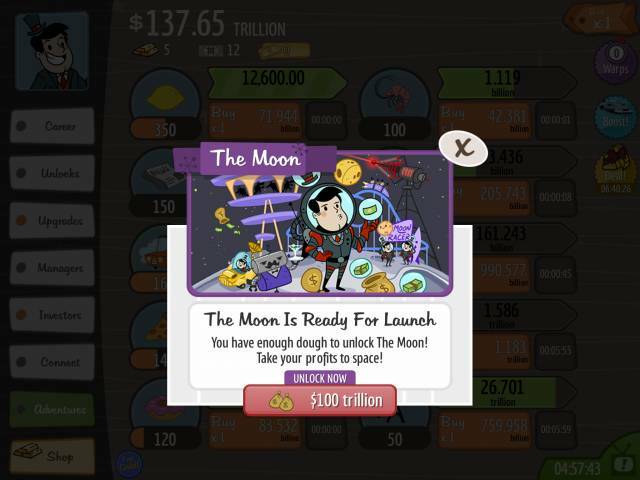 If you check the adventures tab you will see that you can unlock the Moon - And Mars, for a certain amount of cash. The Moon $100 trillon - And that opens up a whole new world of business for you. And later you can also unlock Mars for 100 Mega Bucks. I Mega Buck is equal to 1 Decillion dollars so this may take some time! You can get Mega Bucks by using the Exchange facility in the Adventures tab. On the moon it's basically you do more of the same but with a whole new array of businesses! Check out the Payday Clone Business on the Moon, it offers a great profits in relation to the other early businesses on the moon, so you'll want to get that to a high level asap. After about an hour or so of playing and making some steady progress you probably would have unlocked all or most of the businesses, and things may have started to slow down on the upgrade front and you may be finding it hard to buy new business items. At this point you may want to consider using one of the free time warps to kick things off again. Yes, time warps will be more useful later in the game, but you could probably do with using a couple early on in the game to get your businesses started. You can also by more time warps with gold. For example 10 gold gets you a 24 hour time warp. A time warp is basically you get all the cash you would have earned for the period of the time warp. So a 3 hour time warp gives you the money immediately for 3 hours work of your business. There are few tips and tricks to get free gold. 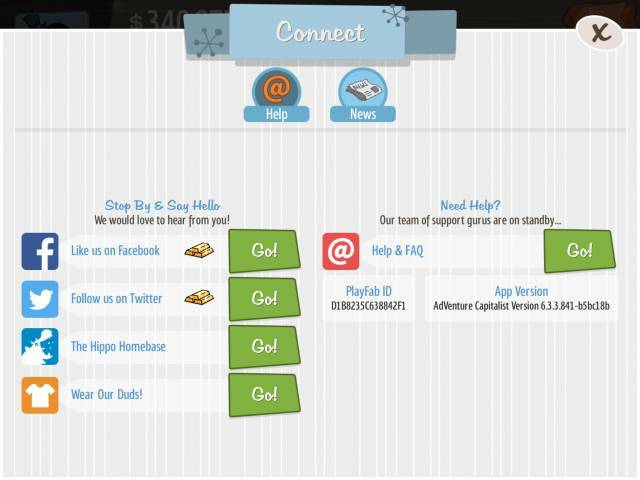 Will get some free bonus gold if you follow the developer on Twitter and like them on Facebook, if you go to the Connect screen you will see how to do that. At the bottom of the screen you may also see a small free gold icon, tap that to see what offers there are to earn gold, they usually involve installing an app and sometimes progressing to a certain level in it. We'll leave it to make your own mind up to work out if it is worth it or not for you. 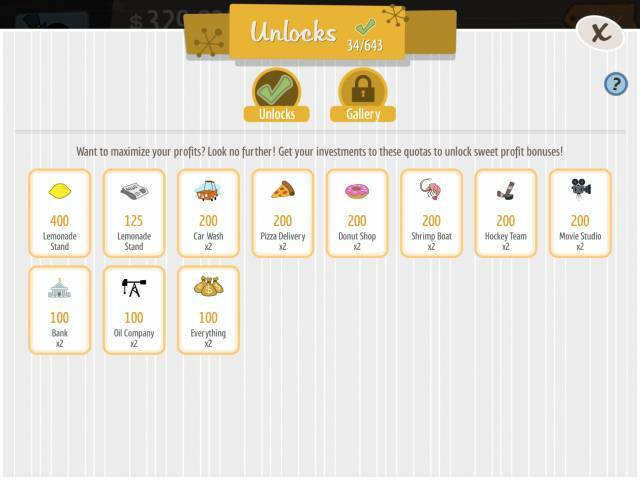 You will also get free gold by reaching certain milestones in the game, 5 or 10 gold is sometimes given when you unlock some of the businesses. Sometimes you also get the option to watch a video ad to get some free gold. From time to time, there are events in the game, sometimes the rewards are gold. Sometimes there is an offer to get free Mega Bucks by watching an ad video. When this offer is available it will show as a badge icon on the right of the screen. 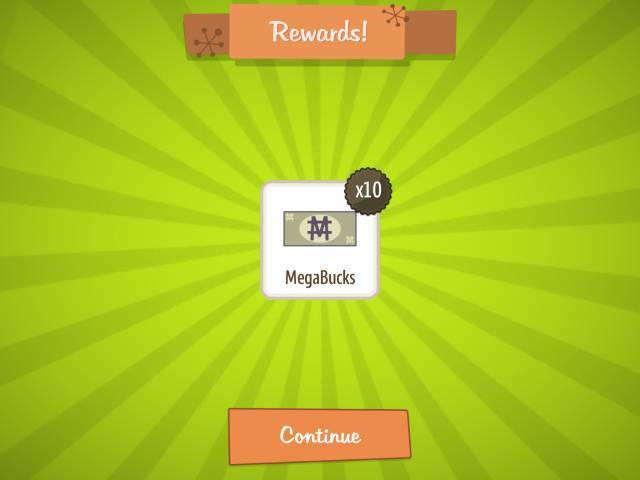 You can also get free Mega Bucks by getting to certain milestones in the game. For example if you get to 50 oil wells, you'll get 10 Mega Bucks for free. As you unlock these, more become unlocked for you to chase. Same on the moon there are similar unlocks to boost your profits. The bonuses will generally speed gets doubled, so take a note of these targets and try to hit a few. On the Moon, it is clear that Oxygen Bars and Payday Clones offer the best profits, so check out how much you are making with those businesses and upgrade them. On Earth probably the bank offers the best ratio of profit to investment. In the investors tab you may get an opportunity to start over with your businesses by you will get better multipliers when you do this. So it is one step backwards to take two steps forwards. It's a tough decision, but is generally worth doing in the long run.